Well you can not afford to miss out on this! The youth camp 2014 is going be one of the best experience ever, yes I said one of the best ever, so prepare your self for this amazing experience organized by Reach A Hand Uganda, it’s going to be a custom camp for young people, tailored to answer some of the most confusing and pressing concerns about young people’s sexuality in Uganda and the East African region. In this camp young people will develop campaigns and action plans to address some of the challenges faced by adolescents. The camp shall be held in May 2014 at Hanna Mixed Nsangi that has provided the most of the facilities like accommodation, swimming pool, main hall, playground among others starting 27th April to 2nd May 2014. The camp will host 600 young people from different schools. The objectives of this camp will be to Increase the knowledge and life skills on adolescent Sexual and Reproductive Health & Rights (SRHR) among young people especially girls. Reduce dropout due to early marriage and early pregnancy. To influence the school authorities and local leaders to put in place modified cultural practices and beliefs that will reduce violence against girls and young women. 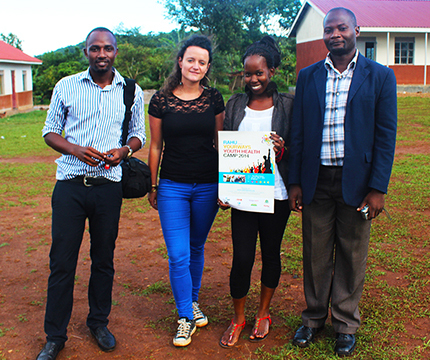 Increase the uptake of SRHR services of the young people during the camp. I repeat You DO NOT WANNA MISS THIS !! !